These no-yeast, no-rise, make-ahead, Ridiculously Easy Cinnamon Rolls employ a secret technique that makes them melt-in-your-mouth delicious! Did you know that my job is to make your life easier and more delicious, at the same time? My favorite kind of recipes to share on the blog, are those that will knock the socks off your family and friends. The kind that will have them raving and begging for more. All with minimal amount of effort from you. These Ridiculously Easy Cinnamon Rolls check all the boxes! You may be beginning to notice a theme going on here. First of all, there were the Ridiculously Easy Biscuits, a recipe that took the difficulty out of traditional biscuit making, yet produced flaky, tall, simply irresistible biscuits. The recipe includes a technique that originated with the smart folks at Cook’s Illustrated. They figured out that instead of having to “cut” butter into the flour mixture (the classic biscuit method), you could get the same results by simply combining very cold buttermilk and warm butter, resulting in “globules” of butter suspended in the buttermilk (see picture below). This lumpy mixture is then combined with the dry ingredients. The result is the same flaky, tall, irresistible biscuits – with much less work! Because the biscuit recipe was so easy, I decided to try the same unique technique with my favorite scone recipe. Oh my! The scones came out incredibly delicious – and much simpler than the original recipe. It worked so well, we decided to make a video, to demonstrate this crazy easy method. You can check it out in this Ridiculously Easy Maple Pecan Scones post. Would it work with cinnamon rolls? Recently my granddaughter, Annie asked if I would make cinnamon rolls for her birthday that’s coming up soon. That got me thinking… normally cinnamon rolls are made with a yeast dough, but I wondered if I could use the Ridiculously Easy Biscuit recipe with a cinnamon roll technique. I gave it a try and we were quite amazed at, what I now call, Ridiculously Easy Cinnamon Rolls. Like the biscuits, they rose up beautifully with lots of flaky layers. The aroma that filled the house as they baked was beyond amazing! See what I mean? There’s definitely a theme going on, a ridiculously easy theme! Although I love traditional cinnamon rolls, there’s something really nice about not having to go through the whole yeast proofing and rising steps. For this recipe you simply make the Ridiculously Easy Biscuit dough, roll it out and sprinkle with cinnamon/sugar, then log roll it and cut in slices. You can either refrigerate the slices till ready to bake or go right ahead and pop them in a hot oven. A great recipe to throw together before the family or guests wake up. I can assure you, they won’t need an alarm clock to draw them to the breakfast table! Annie spent a few days with us recently. Since we always love taste-testers, I made these Ridiculously Easy Cinnamon Rolls one morning while she was here. Annie helped us with icing the rolls and the photo shoot. Well, there was one other thing she helped us with. You’ll see what I’m talking about in a minute. Annie will turn 11 on her birthday at the end of June. I’m wondering how in the world that happened! Seems like yesterday that her family left to make their home in London. Annie was three at the time and such a wee one. Right before they left, we had family pictures done. Annie’s in the middle, on her mom’s lap. Now, 7 years later, they’ve moved back and she’s a young lady! Makes me so want to appreciate every minute with these little people. Life is short and I’m realizing more each day that children grow like weeds! Wonderfully nice weeds, that is! This taste tester gave the easy cinnamon rolls a 5-star rating. Yours will too! Don’t cheat on the time for the buttermilk in the freezer. You want it really cold (but not frozen) in order for the little globules of butter to form. You don’t want the butter too hot. If you melt the butter at the same time that you put the buttermilk in the freezer, the temp will be perfect. Use plenty of flour on your work surface when kneading the dough. If the dough is sticking to the counter or your hands, you need a bit more flour. Don’t like raisins? Just skip them, the rolls will still be wonderful! I love these pre-cut, sheet-pan-size sheets of parchment paper. They make baking, so much easier as there’s no tearing and/or measuring of the paper and no dirty pans to clean. The sheets will last forever – unless you’re a crazy baker like me – then they’ll only last half way to forever. Rolls can be made ahead of time, up to the baking step. Cover lightly with plastic wrap and refrigerate till just before baking. 1. Adjust oven rack to middle position and heat oven to 425°F. Line a sheet pan with parchment paper or spray a sheet pan with cooking spray. 2. In a medium size bowl or cup, measure 1 cup of buttermilk and place in the freezer while prepping other ingredients (you want it to be in the freezer about 10 minutes. 3. Place butter in a microwave safe bowl, cover with a paper towel and heat on high for 1 minute. If not completely melted, return to microwave for 10 second intervals till melted. Set aside to cool a bit while prepping other ingredients. 4. Whisk flour, baking powder, baking soda, sugar and salt in large bowl. 6. Add buttermilk mixture to dry ingredients and stir with a sturdy spatula, just until all flour is incorporated and batter pulls away from sides of bowl. 7. Generously flour a work surface. Dump dough onto prepared work surface and turn to coat all surfaces with flour. Knead on counter 15-20 times (about 30 seconds) until dough forms a smooth ball. Add a little more flour to the work surface. Flip dough twice to coat with flour. 8. With a floured rolling pin, roll the dough out into a rectangle, approximately 12 x 8 inches, with long side facing you. Combine sugar and cinnamon. Sprinkle dough with sugar mixture and raisins (or currents). 9. Starting with the long end facing you, roll up dough and pinch edge together to seal. Cut into 8 1 1/2-inch slices. Reshape slices into a circular shape (if they’ve become flattened while cutting) and place on prepared pan, spacing about 2 inches apart. 10. Place in oven and bake until tops are golden, about 15 to 18 minutes. 11. While the rolls are baking, make the icing by whisking together the powdered sugar, half and half and vanilla until smooth and creamy. 12. 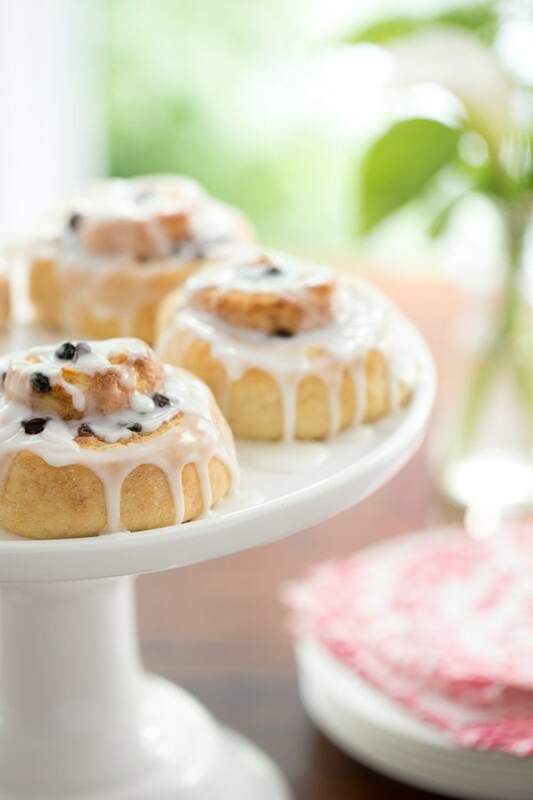 Drizzle icing over cinnamon rolls while they are still warm. Looks very interesting and I will be trying the recipe soon! Thank you for sharing! Annie has grown so much and she’s beautiful! You can carry on with the Ridiculously Easy series as long as you like, I love it. I also love this recipe. Years ago I made cinnamon rolls that used cake mix because I didn’t want to be bothered with yeast. Thank you for solving that problem for me! They look beyond scrumptious. Loved to see your granddaughter enjoying one of those. I am sure they disappeared in the blink of an eye. Of course, you had me at “easy.” Great looking family you have there, Chris. You should be proud! I love how easy these are Chris! I’ve got to give them a try for weekend company! LOVE the family portrait. What a beautiful family! Another fabulous recipe, happy birthday to your Annie! When entertaining I always check out your site for ideas. Your recipes always work they are like Ina’s tried and true. That’s a HUGE compliment, thanks so much Cheri! I think you’ll love these cinnamon rolls! You had me at ridiculously easy Chris, a must try! I’m a big fan of the precut parchment sheets too, so much easier! My goodness how time does fly! It’s most apparent in how quickly our grandchildren are growing, and how many gray hairs I see on my head! I love your secret method and the easy preparation of these gorgeous rolls. The photos, and rolls, are mouth-watering for sure! Have a fantastic weekend Chris! Haven’t made these yet but I am going to very soon as I seldom have very good results with cinnamon rolls so they scare me. Don’t know how I manage to mess them up so much. Love seeing pictures of your beautiful family and grandchildren. Thanks so much for sharing your recipes. What a great idea! My family loves when I make cinnamon rolls, but they’re usually made a day ahead of time because of the yeast. These will definitely be on the menu next time Nick is home for the weekend!!! Annie has become such a lovely young lady! Look 🙂 We are feeling the same things ..how quickly all this is going by..Lucas will be 12 in August..his grade 6 grad dance at 6..coming by here for a few minutes first..just want to say you have a beautiful family..love your recipes and in fact your asian salad dressing was made today..in the fridge it is poppy seeds and sesame seeds et all..she’s lovely!!! PURE genius ~ I’ve always been scared off from making cinnamon rolls, but I think you’ve given me the confidence to try ~ love the family pic! I’m with you Susan, we have to seize the day and enjoy these times together! Your Annie is gorgeous! Our Annie is 11, too! I can almost smell these, they look fabulous, and are a much better recipe for us than any others! That’s amazing Ginny, that we both have Annies that are 11! Your Annie looks like such a sweetheart! I have to try that warm butter cold buttermilk trick! These cinnamon rolls look fabulous!